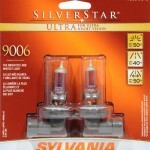 Sylvania is one of the biggest names in the halogen headlight bulb space. 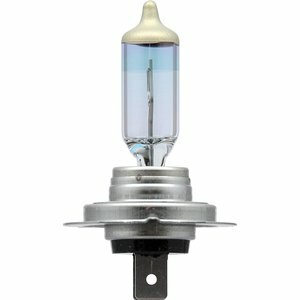 They offer some of the most reliable and highest performing headlight bulbs on the market today. For this reason, we’ve decided to compare two of the most popular halogen replacement headlights, the SilverStar Ultra and the XtraVision, so that you can decide which would be the best headlight for you. The three main types of headlights today are halogen, HID, and LED. We’ll be comparing two of the best halogen headlights here. 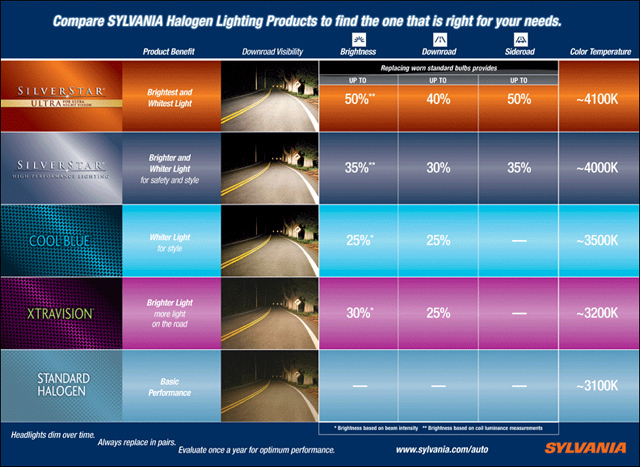 Sylvania offers a variety of headlight bulbs with varying performance and longevity. Notice they offer a SilverStar and a SilverStar Ultra. Our focus will be on the SilverStar Ultra since it is the more popular of the two, and claims to perform better from a light output perspective. Why compare two different bulbs from the same manufacturer? 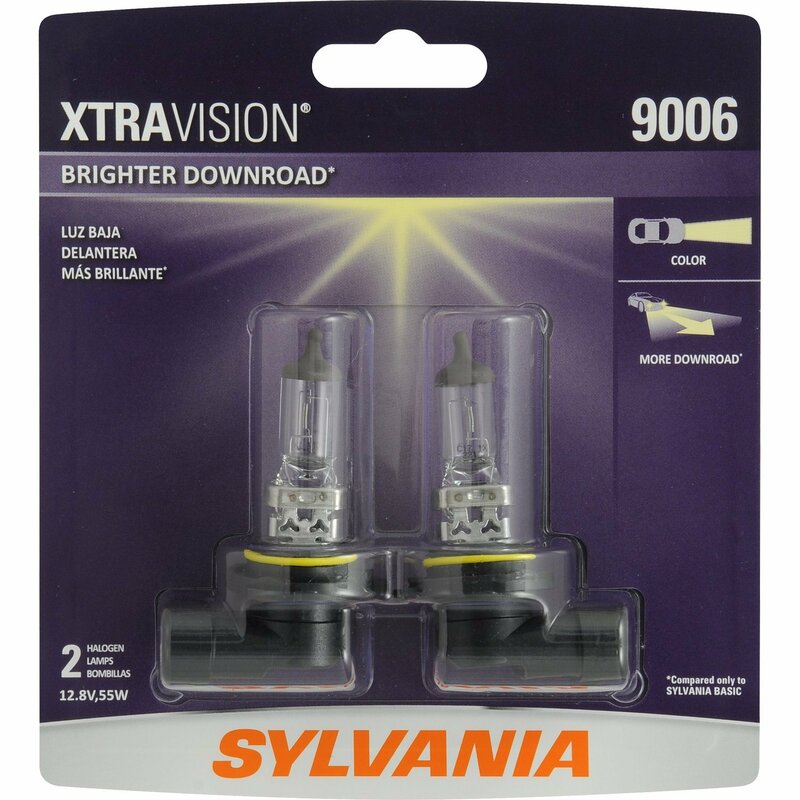 Sylvania is a leader in headlight technology, so it stands to reason that at some point in time you’re going to have to pit one model against another. This is one of those times. The reason we’ve come to this conclusion (to compare the two) is because a lot of consumers have some basic questions about which one is actually better than the other. Not only is there a difference when it comes to cost, you also have a difference when it comes to performance and longevity. So let’s get into the bare bones details about each of these headlights. One of the first things people notice when they begin shopping around for a headlamp is cost. There’s a wide range of options available, from headlights less than $10 per pair to more than $30 per pair, and even higher than that! One of the first things people notice about these two is that the SilverStar is quite a bit more expensive than the XtraVision. That must mean it’s a better bulb, right? Not so fast. That is usually the first impression, especially when you’re considering they’re both from the same manufacturer! I mean, come on … if a company is going to produce two different bulbs, one twice as expensive as another, then it stands to reason it’s going to be twice as good. That may not be the case, though. There are actually a number of advantages to relying on the UltraStar bulb at twice the price compared to the XtraVision, but there are also a number of advantages the latter has over the higher priced one. The bottom line on cost. If price is important to you (and let’s admit it right here … if price isn’t important to you, then this category really means nothing), then you may immediately jump to the conclusion that the XtraVision is the choice for you. After all, paying almost half the price of the UltraStar means more money remains in your wallet. However, when you’re talking about saving money, it’s always great to find a decent bulb for almost half the price of a ‘higher end’ one. Before we get into other details about these two bulbs, let’s look at the main specs, side by side, for analysis. At first glance, it seems as though the XtraVision is actually a much better product. After all, it has a life expectancy of 850 hours compared to a measly 250 hours for the UltraStar. But that’s just one small part of the larger story. Remember that as we dig deeper into this. 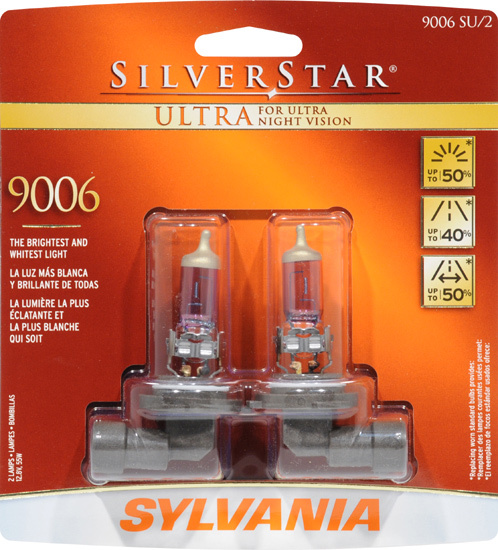 If you spend some time scouring the Internet and the message forums, especially for automotive topics, one thing you begin to realize quickly is that the Sylvania UltraStar headlights, though highly popular, only last between 10 to 12 months, on average. Of course, that all depends on how often you’re driving at night or with the headlights on. Now we’re going to get down to the basic pros and cons of each of these headlights. For each subcategory, we’re going to highlight a clear winner or give it a draw. Obviously, this one has to go to XtraVision. When you compare the XtraVision’s 850 hour longevity to the UltraStar’s 250 hours, there’s no comparison. Lumens basically measures how bright the bulbs are. Within the U.S., there are specific regulations in place so that one manufacturer can’t blind all the other drivers on the roads. Several years ago (going back a decade or more), there were a number of new fangled bulbs coming on the market that were so bright, even on a low beam setting it was as though they were the bright (high beam) setting for the standard at the time. It was dangerous for other drivers. Now, you have maximums that can’t be exceeded, so both of these bulbs are registering 1000 lumens. That offers good visibility out on the roads. What does this mean, really? If you’re driving at night and the headlights on your car aren’t really giving you good sight, or you’re still squinting, trying to discern where the lane ends, especially if it’s raining and the cloud cover is thick. The higher the color temperature, the easier it will be for you to see into the thick night air. In this category, the SilverStar Ultra offers a higher color temperature, measuring at 4000 K (Kelvin) compared to 3200 K for the XtraVision. If you take a closer look at each bulb, you’ll notice the UltraStar has a light blue tint to a portion of the lens (the glass encasement), which helps to disperse light across the night sky better. This allows you better visibility at night. It may seem as though 800 K is not really a significant difference, but it is. It could be the difference between you seeing those double yellow lines, or the bicyclist trying to get home after an extended ride, or not seeing those things until you’re just about on top of them. Both of these bulbs use halogen technology, which some people claim is not nearly as powerful or beneficial as the newer HID headlights. High-Intensity Discharge bulbs can also use xenon and provide a much whiter light, which is engineered to mimic natural sunlight better. You know when you’re driving during the day, you have little trouble seeing things down the road. As long as you’re paying attention to the road (you know, keeping that phone where it belongs and not fiddling with the radio settings every two seconds), you don’t really find too many surprises. Your visibility during daytime is much better than it is at night. With the HID bulbs, you get a bit more visibility, and the illusion of more power from those bulbs. Halogen bulbs are the traditional type of filament bulbs. They still work well, and you’re not going to have much trouble with either one of these, but you don’t gain the advantage the new HID styles offer. More and more people want to do whatever they can for themselves. When you bring your car or truck into an auto service center, you end up having to pay a minimum rate, even for one simple task. Unless you’re good friends with a mechanic who isn’t going to rake you over the coals to change a headlight, you’ll have to pay some good money, all on top of the cost of the bulbs themselves. Most car manufacturers today have wised up to the fact that more and more people would be reluctant to bring their car into a service center just to change the headlights. Therefore, they may have a tendency to keep driving with only one for as long as they could. That’s not safe. So it is actually much easier today to change a headlight in most cars or trucks than it was years ago. For both the UltraStar and XtraVision, the installation process boils down to how complicated any particular vehicle is to gain access to the bulb in the headlamp. Once you have access, it’s a matter of easing the old bulb out and inserting the new one, generally with a two-pin configuration. Never touch the glass on a halogen bulb! Whenever you’re replacing a halogen bulb, it’s important to make sure your greasy fingers never touch the glass of those bulbs. The oil residue on your fingers can actually weaken the bulb, especially under intense heat generated when they’re illuminated. Use a paper towel or pair of gloves instead. When you’re getting two different products from the same manufacturer, you might expect the same quality. With regard to basic construction, that’s the case with both the UltraStar and the XtraVision. However, because of the color temperature and longevity, you have two completely different factors impacting one’s perception of quality. If you are more concerned about how long a headlight will last, then you should certainly focus on the XtraVision. Does this mean the quality is better? No. It means it’s offering a different benefit. If clarity at night is more essential for you, then the UltraStar is certainly the headlight you’d want to choose, if forced to choose between the two (though a LED or HID headlight would offer even better visibility). As far as quality is concerned, you get decent quality with both. 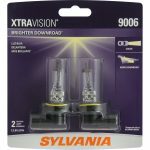 The bottom line is this: if you’re looking for a headlight and you’ve narrowed your choices down to the Sylvania UltraStar or XtraVision, you need to decide what’s more important to you: saving money and having a headlight that lasts longer or enjoying better visibility, especially on those dark, rain-slicked roads. That’s really what the difference between these two is all about.